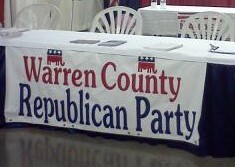 The Warren County Republican Party periodically reviews and adopts its party platform principles. It last adopted the 2016 Republican National Committee Platform to guide the local party in its endeavors. At Large Board members include: Bill Dowden, Brad Lamoreaux, Shari Huff, John Roesch, and Steve Wilson. Audit Committee members include: Lauren Clouse, Steve Jones, and Doug Greathouse. We look forward to working with you. In the meantime, please feel free to contact us if you have any questions or concerns.